Since man first learned to craft a fine edge on a rock an eon ago, knives have been essential tools. Even today, in the era of impenetrable packaging, most people still carry at least one blade with them at all times (and have invariably left several at airport security checkpoints along the way). A good knife is especially important in the great outdoors, where you might face primitive conditions and unusual challenges. Most knives come in one of four basic materials: carbon steel, stainless steel, ceramic or titanium. Each has its pros and cons. Steel knives can also be stamped or forged. Forged blades are the most durable and expensive. Stamped are usually the cheaper and least durable. Carbon steel is easiest to sharpen and holds an edge pretty well. It will stain and rust, however, so some regular attention is needed, such as oiling the blade. Stainless steel will not stain easily, hence the name. It also takes an edge well, but is more difficult to sharpen once dulled. Ceramic knives, usually made of zirconium dioxide, hold a very fine edge, are light and wear-resistant. They also won't corrode. They can be, however, more brittle, and require a diamond sharpening stone. Titanium knives are also corrosion resistant; they won't rust in salt water, for example. They are also lighter than steel and non-magnetic, and hold an edge longer than steel blades. Expect to pay a premium price, however. The design of the knife also plays into its usefulness. The first decision is between fixed and folding blades. A fixed blade knife, such as you would use in your kitchen, requires a sheath to carry it. A folding knife is more convenient, but has the disadvantage of a weakness at its pivot, which can break under a heavy load. A folding knife could also close when you don't want it to — ouch! Look for a locking mechanism on a folding knife to alleviate this danger. Such a knife might be one you would carry with you when exploring the wilderness, whether berry picking, caving, summit-bagging or bird watching. Most survivalists recommend a fixed blade for this purpose. In the best of these, the tang, or the opposite end to the blade tip, will extend the full length of the handle (also call the hilt) for maximum strength. Make sure the sheath has a belt loop, a lanyard to hang it around your neck, and a strap that holds the blade in the sheath, even when carried upside down as some are wont to do. A drop-point blade might be best as an all-around knife. A thumb rest will protect your hand from slipping up the blade. If you aren't fussy about the appearance of the blade, a carbon steel one would be easiest to sharpen, even if you end up having to do so against a rock as you try to bushwhack your way back to civilization. A good example of a survival knife is this Gerber Bear Grylls Survival Series Ultimate Knife, $40 from Amazon.com. Hunters use knives not just to dress the game they kill, but for purposes such as hacking brush to clear a shooting lane. For them, a drop-point is a good choice for a basic blade. Again, the possible heavy use favors a fixed blade. The hunter might also carry other knives such as a skinner and/or a caping knife if he plans to dress the game for eventual taxidermy. An important consideration here is the handle material; you'll want a non-slippery handle. Wood isn't that durable and grippy, and some plastics are slick. Look for rubber, man-made materials such as Kraton or Micarta, or perhaps stacked leather. An example of an excellent quality hunting knife might be the Master Hunter Hunting Knife by Cold Steel Knives, $110 from Bass Pro Shops. Anglers who keep what they catch have need of a specialized blade, the fillet knife, to clean their catch. This long, thin and flexible blade is used to remove the skin and separate the meat of a fish into long fillets. Unlike other blade uses, flex here is a positive attribute. Again, a good non-slip grip is essential, as is corrosion resistance. For eons, the throwing of a knife could mean the difference between life and death, and today there are those who graduate from corn hole to the sport of knife throwing. While one can throw any knife, there are some especially crafted for competition. These knives have a teardrop point that is sharp only at the tip. They are thin and have little or no handle, so that the blade is evenly weighted on either side of its midpoint. Some people like to carry a blade without others knowing about it, even when out recreating, so there are many types of stealth knives on the market. Despite owning all these specialized knives, however, chances are when you come across the need for one you'll have your own pocket knife closest at hand. So what pocket knife should you carry? Certainly the knife should have at least one blade and fit comfortably in your pocket or purse. Other useful features might include a blade lock, screwdrivers both flat-blade and Phillips, corkscrew, scissors, nail file, saw, awl, can opener, toothpick and tweezers. A lifetime warranty, such as those offered by Victorinox, is also a useful inclusion, although if you have a propensity for losing knives the guarantee isn't quite so beneficial. Tom Barlow formerly wrote for Aol's WalletPop and DailyFinance, and in addition to his dealnews contributions, he currently writes about lifestyle topics for Forbes.com. You can follow him on twitter @tombarlow. You can also sign up for an e-mail alert for all dealnews features. I like the Ken Onion knives. I got a Chive as a groomsman gift almost 10 years ago and the thing has been awesome. The speed-safe opening mechanism is great (almost like a little switchblade), it's small, and super-sharp. Looks cool too. I'm a pocket knife carrier, had one in pocket for at least the last 15 years. For an all around good knife to always have on you. 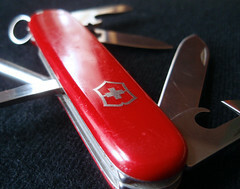 I would suggest a Victorinox Huntsman.